World Trade Center 3: Each week another story. 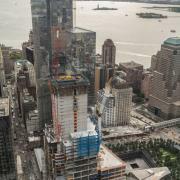 Rebuilding at Ground Zero moving full speed ahead; World Trade Center Complex will serve simultaneously as a new landmark and a memorial for New York. Following Towers 2 and 4, Austrian formwork experts’ know-how is required for Tower 3 as well: Doka is providing formwork solutions, engineering design and field supervision to support the construction schedule. 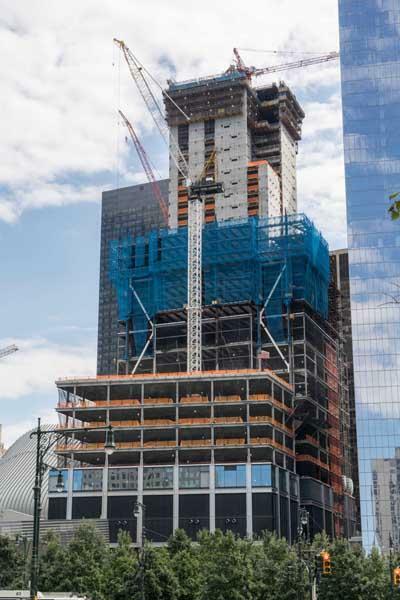 After a standstill lasting several months, construction of the World Trade Center Tower 3 continues under the leadership of Roger & Sons Concrete. 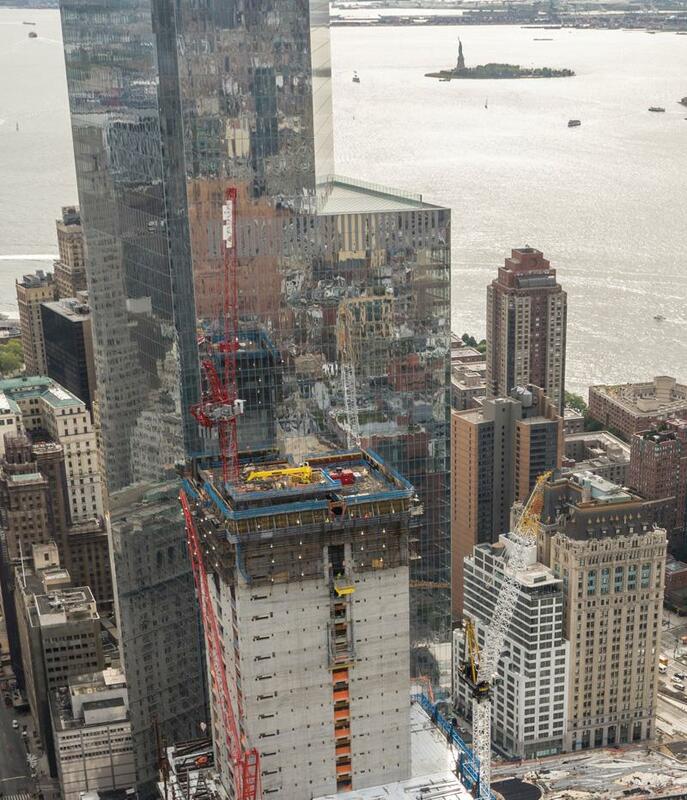 Owing to its decades of experience in highrise construction, Doka was secured as the reliable formwork partner for 3 World Trade Center. 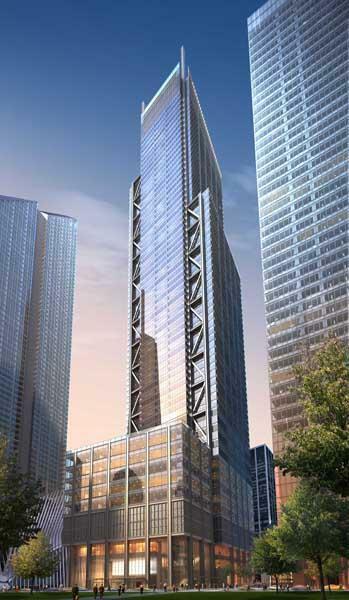 Upon completion, the tower also known by the name of its address, 175 Greenwich Street, will boast an overall height of 1079 ft.
For his design of the 80-story tower, British architect Richard Rogers of the architectural firm Rogers Stirk Harbour + Partner was awarded the Pritzker Prize. The building planned to be the third-highest on the World Trade Center-area is characterized by a design that combines concrete and steel. The core made of reinforced concrete is enveloped by the silhouette of a steel structure; the facade consists of glass. Most stories will accommodate offices. Shops and technical facilities are slated to occupy the podium consisting of first eight levels. A massive reinforced steel core with built-in lifts and staircases dominate the interior of the building. This structural concept meets the highest requirements for safety. 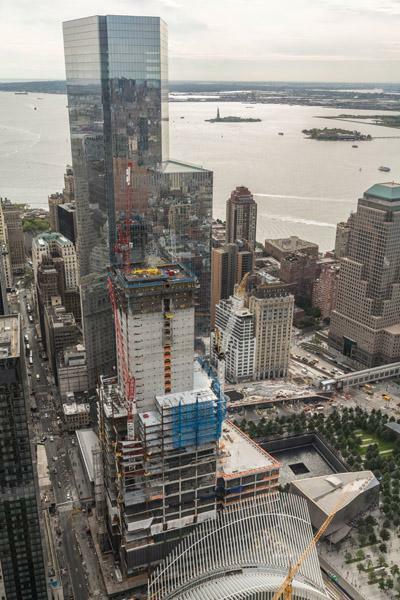 All other sister towers of the World Trade Center are built based on the same principle. In order to optimize formwork utilisation, Doka engineers recommended a solution consisting of automatic climbing formwork, timber-beam formwork, crane-less and therefore cost-saving table lifting system, as well as innovative floor props for above-average ceiling heights. The automatic climbing formwork SKE100 plus capable of transporting up to 10 t per unit is ideal for repositioning large working platforms and wall formwork consisting of framed formwork Frami S and large-area formwork Top 50 S. The automatic climbing formwork is used on the outside of the building; it ensures rapid construction progress as well as safety for the site crew. The platform levels are completely enclosed so that the personnel can work safely in any weather condition and even at wind speeds up to 45 mph. The self climbing table lifting system TLS that is also attached to the exterior wall is the safe way to reposition floor-slab formwork, tools and other equipment without the need for a crane. 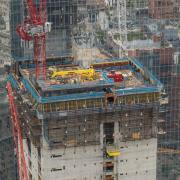 The inner building core is poured using the high-performing automatic climbing formwork, the Super Climber SCP. 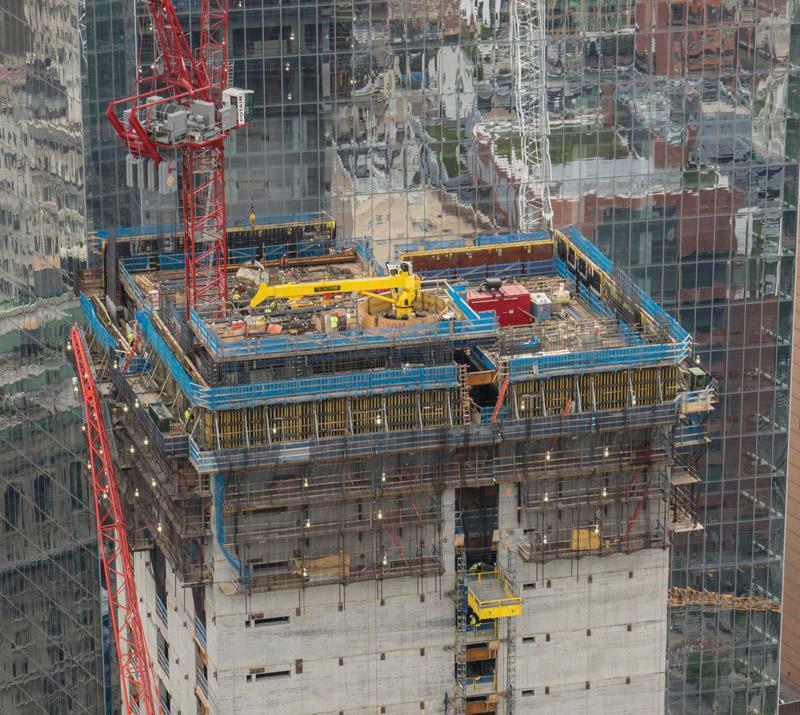 By using the Doka Super Climber SCP, the very fast self-climbing formwork system in the North American market, the inner building core grows taller 12.80 ft respectively one level a week. Projections call for the 200-m-mark (760 ft) to be surpassed by the end of 2015. 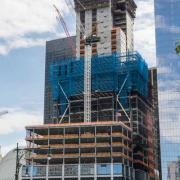 Another proven technology specific to the US market, the 10k shoring system, is employed to prop up large-area floor-slabs with heights exceeding 18 ft. Two Doka stair towers 250 easily assembled from frames and pre-assembled stairway elements are integrated directly into the Super Climber SCP platform and provide intermediate safe access to all working levels. Doka engineers were involved in the planning process from the very beginning and could therefore define the optimal formwork solution according to the customer’s requirement. A Doka formwork instructor ensured smooth assembly on site and instructed the construction team how to use the different formwork systems correctly. 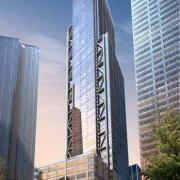 3WTC is scheduled to open in 2017. The integrated safety systems will by far exceed the building code requirements of the City of New York as well as the Port Authority of New York and New Jersey. Certification according to the LEED (Leadership in Energy and Environmental Design) gold standard for energy efficiency is sought as well. Thank you for your interest - World Trade Center 3: Each week another story.. 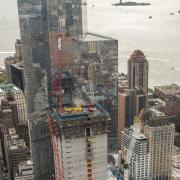 Thank you very much for your interest - World Trade Center 3: Each week another story..